This was posted before Prime Minister Sharon suffered his second and far more serious stroke on January 4. Clearly the political landscape will be dramatically changed because of this second event. I've considered taking this post down out of consideration for the emotional impact of Sharon's illness. I've decided not to, since my purpose here at PoliticalArithmetik is to document the dynamics of political events, and what comes next will certainly be of great interest to political analysts. As it stands, the original post below documents clearly the prospects of Sharon's Kadima party just before his second stroke. Subsequent events and polling will further illuminate the dynamics of Israeli politics in the wake of this stunning turn. Support for Prime Minister Ariel Sharon's new Kadima party appears to have remained stable in the wake of the Prime Minister's December 18th stroke and brief hospitalization. In seven polls taken since Sharon's illness, Kadima continues to receive support sufficient for 39-40 seats in the Knesset. (Likud currently holds 40 seats.) As a new party, rooted primarily in Sharon's personal appeal, it is interesting that support has not wavered in the past 10 days. The "health issue" is likely to be raised explicitly in the coming elections, set for March 28. For an example of the possibilities, see this column from the Jerusalem Post. Support for Kadima has risen since Sharon broke from Likud and established the new party on November 21. 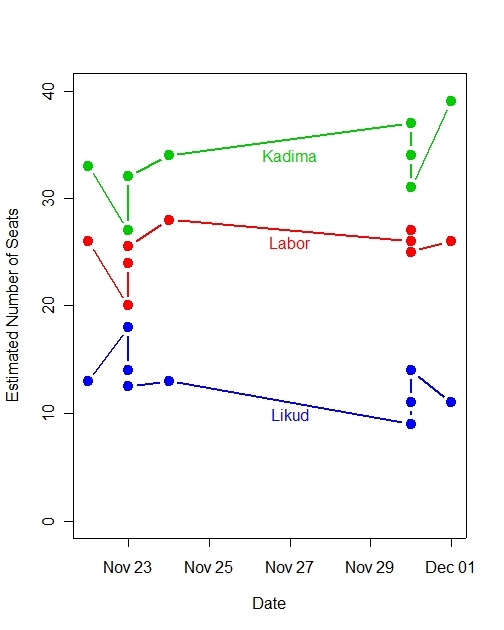 From initial support of 30-32 seats, Kadima grew to near 40 seats by the second week of December. Since that time there has been no evidence of a systematic trend in support, which has remained stable at about 40 seats. The same cannot be said for Labor, behind new leader Amir Peretz, which has seen a substantial decline in support from some 25-26 seats to 19-20.
gain is the first hopeful news for Likud in the past six weeks. The center Shinui party appears to have virtually collapsed. From a total of 15 seats and third largest party in the current Knesset, Shinui is currently polling as low as 4-5 seats. If Kadima, Labor and Likud match their poll results, they should win 75-77 seats. Currently Likud, Labor and Shinui hold 76 seats. With Shinui at only 4-5 additional seats, this division of the vote suggests that there has been considerable shuffling among the these three parties plus the new Kadima party, but the other parties have retained most of their aggregate strength. 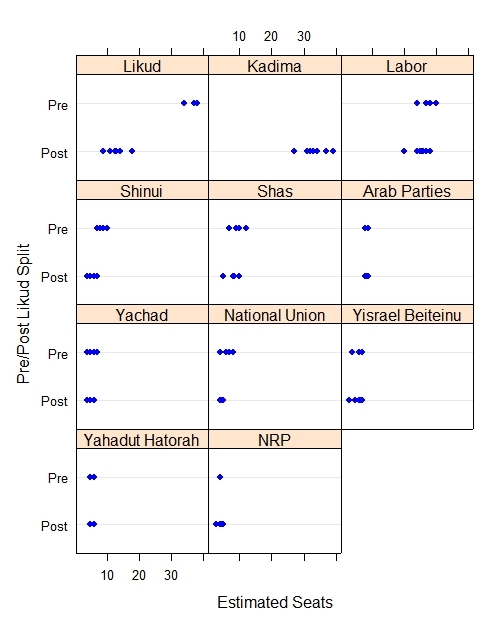 The Sephardic Shas party, currently the 4th largest bock in the Knesset with 11 seats, is polling near it's current level with 9-10 seats in most polls. Polling organizations vary dramatically in the average number of days between polls. 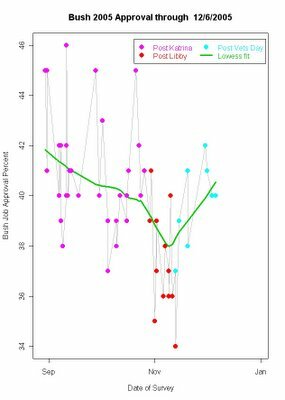 When approval is trending either up or down, the amount of change between polls depends on how often the poll is conducted. This difference poses problems for how reporters frame the results of polls, as reporting this week has dramatically demonstrated. On Tuesday, December 20, readers were confronted with two seemingly incompatible stories about President Bush's job approval rating. President Bush's approval rating has surged in recent weeks, reversing what had been an extended period of decline, with Americans now expressing renewed optimism about the future of democracy in Iraq, the campaign against terrorism and the U.S. economy, according to the latest Washington Post-ABC News Poll. CNN -- President Bush's approval ratings do not appear to have changed significantly, despite a number of recent speeches he's given to shore up public support for the war in Iraq and its historic elections on Thursday. Such dramatically different interpretations of polling data contribute to public distrust of polls and the suspicion (seemingly universal in both left- and right-leaning blogs) that polls are widely manipulated to suit biased media agendas. Oddly, at the same time, poll results that support the blogger's own preferences are immediately embraced as "proof" that Bush is either surging dramatically or reports of surge are a myth, again depending on the blogger's preferences. I've written extensively here over the past week about variability in poll results and when results are really out of line with other polling and when it falls within the limits of normal variation. But there is a different and systematic problem with the interpretation of poll results that deserves attention by those who report on polls. 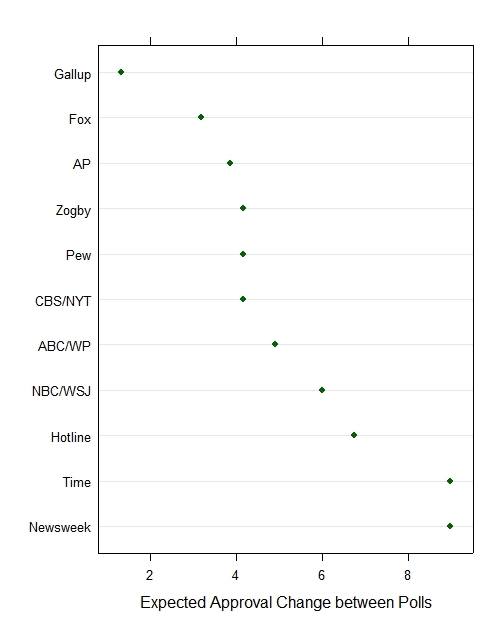 Gallup polls are taken more than twice as often as the next most frequent poll, that of Fox News. 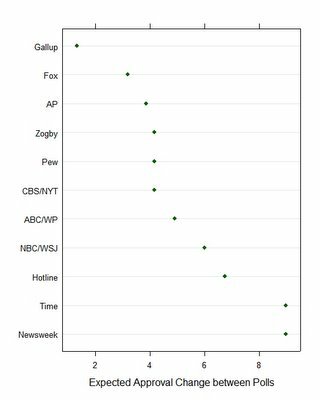 Gallup is 3 times as frequent as CBS News and the New York Times, and 3.7 times as frequent as the ABC News/Washington Post poll. 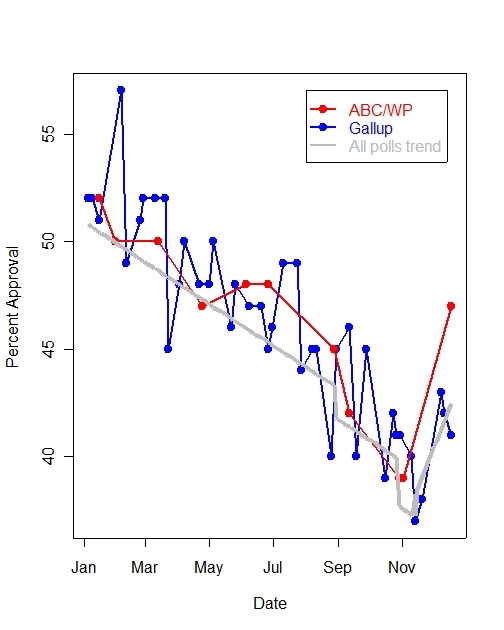 So what happens when reporters compare results between editions of the Gallup and ABC/WP polls? 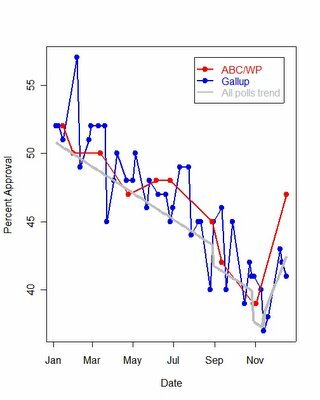 If approval is trending up, as it is right now, then on average, the ABC/WP change between polls will be 3.7 times larger than the change between Gallup polls, even when both are changing at exactly the same rate per day! Since November 11, approval of President Bush has been trending up by +0.1533% per day. Given the average spacing between polls, this means that consecutive Gallup polls would be expected to register gains of 1.3% while the average spacing for an ABC/WP poll means the average gain between their polls would be 4.9%. And that has absolutely nothing to do with the real rate of approval gain, but only the spacing between the polls. Now the average sample size of national polls implies a margin of error of about +/-3.2%. So what's your headline and lede for a story based on the Gallup poll? "President Bush's approval ratings do not appear to have changed significantly" But if you write the lede for ABC/WP: "President Bush's approval rating has surged in recent weeks, reversing what had been an extended period of decline"
Let's take a look at the year-long trends in Gallup and ABC/WP. The figure below shows the two poll's path over the year and the gray line is the linear trend based on all polls taken this year, taking account of the shocks of Katrina, Libby and the post-November 11 aggressive White House response to its critics. Both Gallup and ABC/WP fall a little above the linear trend of all polls, a well documented house effect that need not concern us here, but they track each other quite well. What is also obvious is that there are more blue dots for Gallup polls and fewer red dots for ABC/WP polls. But when the two polls are taken close together in time, they are usually pretty close to each other in results, certainly within reasonable margins for error. So what do these two polls tell us has happened since late-October/early-November? Both show a substantial upturn in approval of President Bush. Gallup's three latest polls raise the question of whether approval is continuing to climb, but compared to Gallup's low points in early November, approval is clearly up. For ABC/WP, there are only two polls-- early November and mid-December. The upturn is more dramatic than Gallup's (though it's low point is also a bit higher so the gain in ABC/WP is +8% while Gallup's is +4%) but the conclusion is obvious from the figure: both polls see an end to the year-long decline and a significant upturn since early November. The differences in these two stories' ledes is primarily a problem of journalistic interpretation of polling trends. Paradoxically, those who poll the most often, are least likely to find significant changes between pairs of polls, though they are more likely to capture short-term dynamics that other polls miss altogether for lack of data. Because news organizations have a proprietary interest in the "branding" of their own polls, news stories lede with comparisons to their own past polls. But this practice is dramatically out of touch with the reality that the public is exposed to a large number of other polls. So when CNN writes that the current Gallup poll shows no change, they are implicitly forgetting the substantial trend over the past six weeks. When ABC/WP writes of a ratings surge, they are ignoring the fact that we've been reading 25 (twenty five!) other polls since ABC/WP did their last poll. Instead their lede is written as if there were no information about opinion in the intervening month and a half. While no news organization will want to lose it's brand name poll, the practice of writing about polls without a context longer than "our last poll" and without a context "in relation to other polls" will continue to produce ledes that are an embarrassment when read side-by-side and which mislead the marginally attentive reader who needs the story to put the results in a meaningful context, both over time and compared to other results. One way to accomplish the first goal is for each story to come with a graphic showing that poll's history over the past year. This would also play to the strength of frequent polling by some organizations-- their graphs would look more informative and authoritative. The second goal could be partially met if reporters wrote their ledes with the implicit acknowledgment that they had kept up with PollingReport.Com (or better, PoliticalArithmetik.) In that case, the ABC/WP poll could be cast as the confirmation of trends seen in other polls. Note the air of authority! Others suggest the trend, but ABC/WP "confirms it as fact". That's not counter to branding concerns but is less misleading and seemingly unaware of 25 other polls. P.S. A reader asked "What's a lede? It isn't in my dictionary." Thanks to them, I found this very nice discussion of the journalist's term (a sign of my misspent youth) for the first sentence or paragraph of a news story. 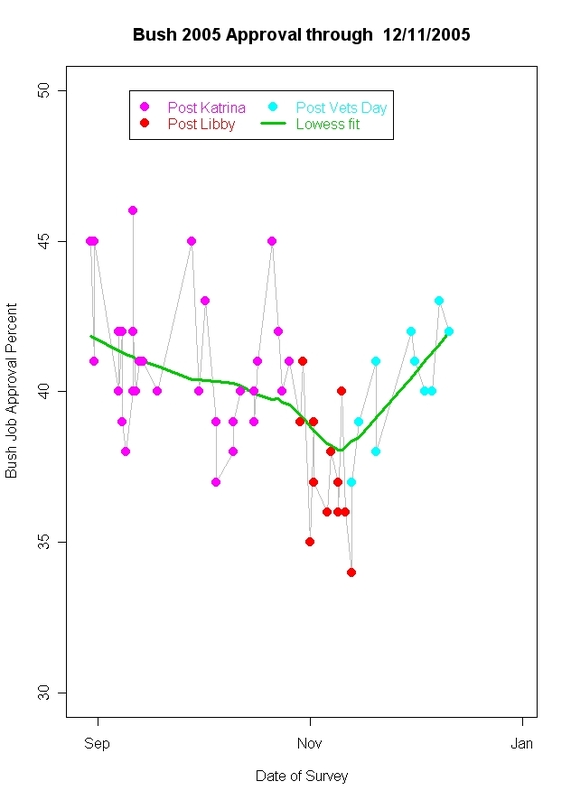 Local regression fit and residuals for presidential approval. The horizontal lines mark the 95% confidence interval for the residuals. Points in red are the Diageo/Hotline polls, points in blue are ABC/Washington Post. New polls from ABC News/Washington Post and Gallup/CNN/USAToday again present us with puzzling differences in the approval of President Bush. 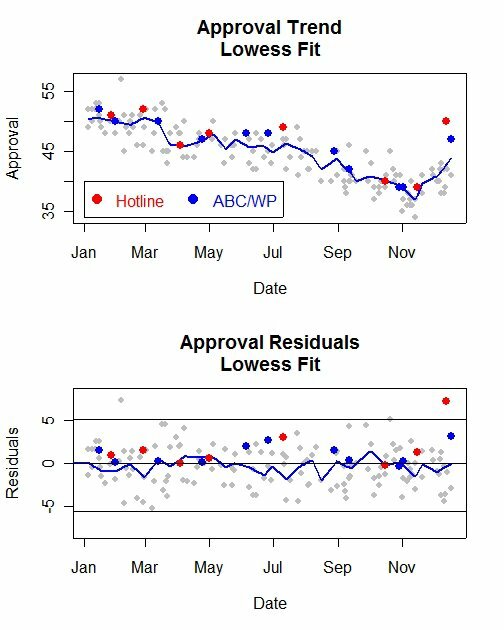 The 47/52% approval/disapproval rating the the ABC/WP poll is a 8% gain since their last poll, 10/30-11/2, (39/60%) which was before the White House launched its aggressive response to critics on November 11. In contrast, the new Gallup poll finds a 41/56% approve/disapprove rate, which happens to be the same as the 41/56% results in their 10/28-30, the Gallup poll closest to the dates of the earlier ABC/WP poll. The most recent Gallup poll, completed 12/9-11 had a 42/55% approval/disapproval reading. This pair of polls resemble the contrast between last week's Diageo/Hotline poll (50/47%, 12/12-13, a +11% increase in approval) and the Fox News poll of 12/13-14 which found support stable at 42/51%. I discussed those results here, and showed that the Diageo/Hotline result was one of the most extreme outliers in my data since 2002. Now with the addition of another pair of polls, one with a substantial approval gain and the other with no gain at all, we again have to consider what is going on here. Since November 11, my model predicts a gain in approval of +5.8% from the low point of approval following the Scooter Libby indictment and Harriet Miers nomination failure. With that gain, the model estimates approval at 42.5%-43.9% as of 12/18. Depending on how you estimate the model, the ABC/WP poll is either within the 95% confidence interval of this estimate (as in the graph above) or just above the upper margin of the confidence interval (as in the graph below). The first point is to not focus on the change since the previous poll by ABC/WP, because that poll is over a month old. President Bush has been gaining support at a rate of +.15% per day since November 11, so we should certainly expect gains from polls taken before November 11. Rather the comparison should be between our best estimate of current approval and the individual poll result. 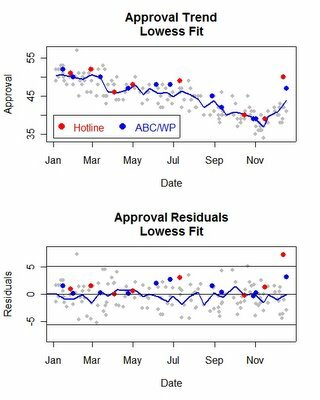 The conclusion here, then, is that ABC/WP is not an outlier, and not inconsistent with the model estimate of 43.9% approval. There are other ways we could estimate current approval. One of those is to use a linear model, rather than a local regression. The linear model is far less flexible, but also less likely to respond to a short term "bump" that doesn't really represent meaningful change. So for comparison, I estimate a linear model here. The data are fit only to the approval data since January 1, 2005. 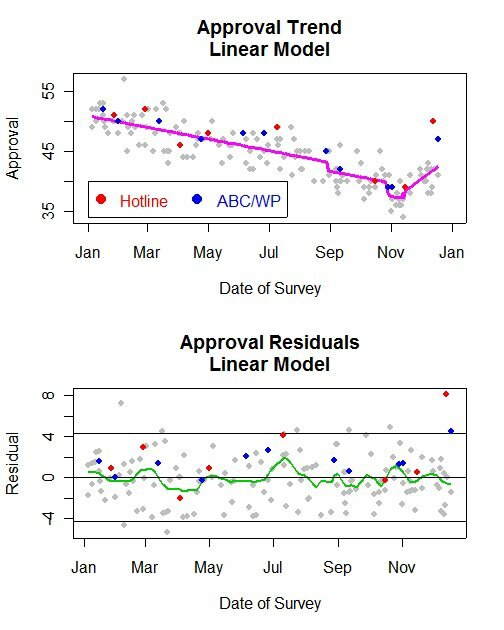 The model incorporates a linear decline in approval from January 1 until November 10. Step-function shocks for Katrina and Libby are also included. Starting November 11, I estimate a linear growth in approval as well as a positive step function to capture the new White House approach. This model has previously been found to fit the data reasonably well, and it continues to do so with the addition of the post-November 11 data. The results of this model are plotted in the figure below. There has been a clear and statistically significant increase in approval since November 11, and especially the upward trend is positive and significantly so. Based on this linear model, approval on 12/18 is estimated at 42.5%. This model also produces a somewhat tighter margin of error, of approximately +/- 4.3%. By this standard, the ABC/WP data at 47% falls just above the upper limit of the confidence interval, 46.8, as plotted in the figure. 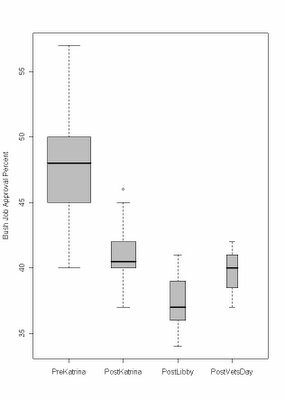 Combined with the results from the local regression model, this makes me view the ABC/WP results with some serious doubt. But the ABC/WP is not nearly as extreme an outlier as the Diageo/Hotline result, which falls clearly outside the confidence interval in both figures. An important aspect of these graphs is the plotting of previous polls by both of these organizations. The Diageo/Hotline polls are in red, the ABC/WP polls in blue. In both figures, these red and blue points track the trend lines in the top part of the figures quite well. In the lower residual plots, all the previous polls by both organizations fall within the 95% confidence interval. This is important because it puts these latest polls in perspective. There is absolutely no evidence from this analysis that either of the polls is systematically out of line with other polling organizations. That these last polls by both are relatively large outliers in no way suggests that the polls are seriously flawed in any way. What it does raise is two points: first, even excellent polls can produce an individual outlier on an individual question. Partisans are quick to seize on a single example to impugn the entire polling enterprise (and quick to reverse themselves if the next poll by that organization is more to their liking.) Second, we need not be helpless in the face of unusual data. If you believe in "just averaging" the polls, then you will include extreme outliers and as a result bias your estimate of approval upwards, in this case. If you look at the polls in the context of the margin of error you can (and I would) discount the value of a single outlier. My estimate here of 42.5% approval is based on a model that discounts the weight given to large outliers. One other important issue is that any model (mine included) can be misled in times of highly dynamic change. It is conceivable that we are currently in a period of very rapid change in presidential approval. The upward trend since November 11 is 5 times as rapid as the downward trend in the first 10 months of the year. So we may yet see new polling that looks closer to the results of the Hotline and ABC/WP polls. But if we do, we will have a new problem: how to explain the larger number of polls that have missed that large upturn. I'm still putting my money on the significant upturn to about 42-43%, and holding off on bets in the high 40s. For now. Spacing of polls confounds the lede. How out of line is the new Hotline Poll? 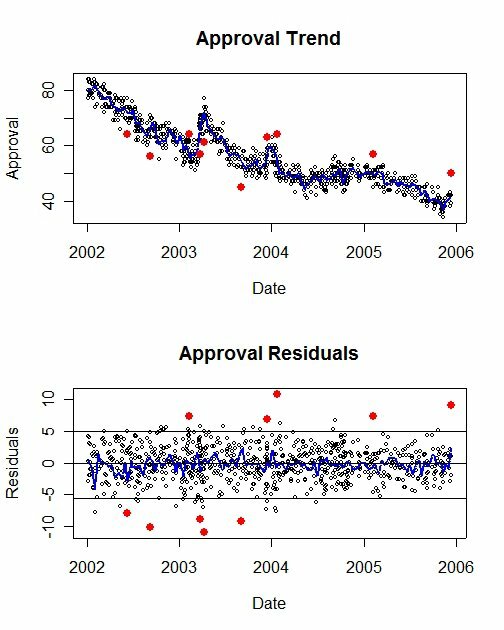 Approval trends and residuals, January 2002-December 14, 2005. The solid red points are the most extreme 1% of all residuals. The middle band marked by horizontal lines includes 95% of all polls. Yesterday the new Diageo/Hotline/Financial Dynamics poll was released showing approval of President Bush at 50%. I posted here about that result yesterday. An email conversation with MysteryPollster Mark Blumenthal has provoked me to follow up on this. Blumenthal suggested looking at other polls that are unusual and using that to put the Diageo/Hotline result in perspective. Excellent idea! And since Typepad is down, Blumenthal will have trouble posting his own thoughts about this to MysteryPollster.com. Credit to Mark for the idea. Blame to me if the execution falls short. All polls are subject to sampling errors, so two polls taken under identical conditions will vary by a highly predictable amount. That variation depends on the sample size (and sample design) and the variability in the population. Polls also vary due to non-sampling errors. These come from question wording, order of questions in the survey, "house" effects due to different procedures across polling organizations, response errors and "everything else" that can lead to error in a poll. The combination of sampling and non-sampling error is often referred to as "total survey error". The problem is that we have well established formulas for calculating sampling error, but the modeling of non-sampling errors is much harder and lacks the formal properties that sampling errors possess. Sampling error reflects the variation in polls we'd find if there were no non-sampling errors. Total survey error reflects the actual variability we see. My approach here reflects the total survey error approach. There are 858 national polls measuring approval of President Bush since January 1, 2002 in my database. (I'm omitting 2001 here because the shock of 9/11 creates unique polling problems that are not present in the 2002-2005 data I use.) The median sample size of those polls is 1004 (I have missing data in the sample size variable, so take this as a reasonable estimate but not necessarily exact.) If sampling error alone were the source of polling variability, then the margin of error we would expect for samples of 1004 cases would be +/- 3.1%. So that gives us a baseline for errors due to sampling alone. To estimate the total survey variability, I fit a local regression to the series of 858 polls. That is plotted in the top half of the figure above. In this case I deliberately use a fit that allows lots of local variation. In other posts, I normally "smooth" this trend more to emphasize systematic trends over time, rather than short term "bumps" that are probably not meaningful. Here however, I want to give the polls the maximum benefit of the doubt. This means that the trend line will respond to what is in fact just noise, but will treat that noise as if it were a politically meaningful signal. This is a conservative procedure because it will tend to UNDERESTIMATE the size of the polling variability. From this fitted trend line, I calculate the "residuals", the observed poll value of approval minus that predicted by the trend line. These are plotted in the bottom half of the figure. The upper and lower horizontal lines include 95% of the polls in the dataset. In theory, these would be symmetric about zero, but in these actual data there are a few more low values than high ones, so the lower bound is -5.55% while the upper is +5.07%. So any poll is subject to this kind of variation, and the total survey error is a good estimate of the amount of variation we should expect in practice. It gives us a benchmark to use in assessing the deviations from the trend that we see in any particular poll. This represents about 1.1% of all polls in my database. So by that standard, the current Diageo/Hotline poll is exceptionally far from the trend line. But every dataset has to have a most-extreme 1% of cases, so what can we make of this result? One conclusion is that we should thank the Diageo/Hotline people for reporting their results despite the large difference from other polls. It is not unheard of for pollsters to bury their results that look too different, or to "fiddle" with the weighting or other things to bring the results a bit closer to other polling. Everyone wants to make news but no one wants to look too extreme. It is, ironically, a sign of the credibility of the Diageo/Hotline people that they were willing to put this result out when it was certain to be remarked upon as out of line with other polling (exactly as I am doing here!). But the fact remains that this poll is far beyond the bounds we would normally expect, even when taking total survey error into account, and not just sampling error. By this standard, we can say that we would very much doubt that the Diageo/Hotline result is simply a random outcome from the same process that has generated all the other polling. But the source of that exceptional variation remains a mystery. Our conclusion should be that this result should be substantially discounted in estimating approval of President Bush. Every polling organization can produce results that are outliers. What is important is spotting them and putting them in proper perspective. That is far more desirable than suppressing the results or pointing to them as examples of "bias". What matters is performance over the long term, not in any single sample. Fox/Opinion Dynamics add to the impression that President Bush's approval ratings rise has slowed. The Fox poll taken 12/13-14 finds approval 42%, disapproval 51%. The previous Fox poll taken 11/29-30 had it 42-48. Both are better than the 36-53 on 11/8-9, just before the White House launched its aggressive response to critics. The latest numbers however show no gain in approval and a +3% increase in disapproval. The Diageo/Hotline poll by Financial Dynamics 12/12-13 shows a much higher approval rating than any other poll since February, with 50% approval and 47% disapproval. That's a stunning result, as the graph makes clear. The Diageo/Hotline result is far removed from other results of the post-Veterans Day polling. The previous Diageo/Hotline poll had approval-disapproval at 39%-59%, which was in line with other results at that time, 11/11-15. As of 3:20 pm, 12/15, the full topline results were not available on the poll's website here so it was not possible to look for a possible reason (partisanship distribution, for example?) for the discrepancy. Even including the Diageo/Hotline results in the estimation above, the blue lowess line continues to suggest a flattening of the rise in approval. 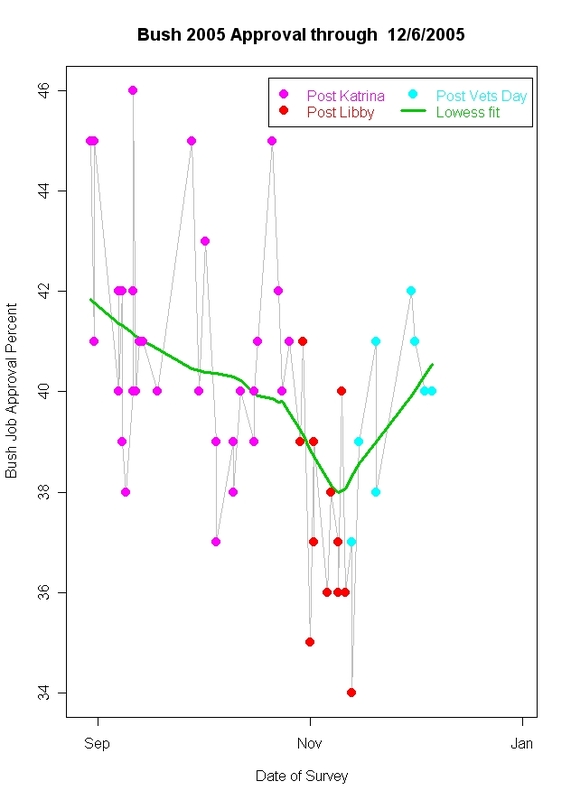 The rising green line smooths the data more and continues to show a rising approval. 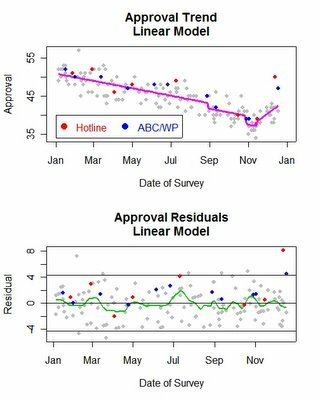 Until convinced by other polling, I'll think of the Diageo/Hotline result as an anomaly and stick with the conclusion that approval has at least temporarily flattened out. UPDATE: 3:40 EST. Diageo/Hotline now has the topline numbers here. Their party identification numbers are 35% Rep, 37% Dem, 20% Ind. The party numbers include leaners. That's in line with other estimates of party. It isn't clear if Diageo/Hotline weights by party id, which would explain this, or if their sample just happens to be this close to what the exit polls would show. In any case, the high Bush approval is not due to a poll heavily weighted towards Republicans. The one difference in the Diageo/Hotline and most other polls is that Diageo/Hotline puts the Presidential job approval question after a battery of favourable/unfavorable ratings of political figures. It isn't obvious why that should prime higher job approval ratings, however. In fact, several of the rated figures (DeLay, Duke Cunningham and Jack Abramoff) might be expected to hurt the Presidents rating, if anything. The one other interesting anomaly is the approval rating within party id category. This poll finds approval of 86%, 44% and 17% for Reps, Inds and Dems. Those are quite a bit higher than other polls have found recently, but are up across the board in this sample. Gallup's most recent results were 81%, 38% and 10% approval by Reps, Inds, and Dems. So, either it is a fluke or a harbinger. What it isn't, is in line with other current polling. We'll see. New polling by Pew, Zogby and NBC/Wall Street Journal suggest that the upturn in President Bush's approval may have stalled. The three polls reported approval levels of 38%, 38% and 39% respectively. (See PollingReport.Com here for the full details.) Disapproval levels in the three polls were 54, 62 and 55 respectively. In terms of changes from the previous polls by the same organizations, the changes in approval were +2, -1, +1. Previous polls have seen gains in approval of as much as +5% over previous surveys. Also new here is a second Gallup poll, taken 12/9-11 that found approval at 42 with disapproval at 55. That was a statistically insignificant drop from 43-52 in Gallup's 12/5-8 poll. While that modest decline isn't convincing by itself, coupled with the three more negative polls, there is reason to wonder if the significant rise we've seen since Veterans day has now reached a plateau, at least for the moment. In the graph, the green lowess fit is the same fit as previous graphs have shown. By that measure the upturn appears to continue. The blue lowess fit reduces the smoothing slightly (from 1/2 to 1/3 for the lowess geeks out there.) With a little less smoothing, the flattening is apparent in the blue line, that is absent from the green line. Local fits of this sort, especially at the endpoints as we are considering, can be quite sensitive to the amount of smoothing, and there is no simple test for the "right" amount of smoothing. My "eyeballing" of the data leads me to see a flattening of the upward trend when these new polls are added, which is why I fit the blue lowess fit. You may take your pick, or wait for more data. In either case approval continues to be significantly higher than the low-points before Veterans Day, but there is at least a reasonable doubt that it is continuing up at the rate it has for the past 3-4 weeks. New polls by Gallup and Cook/RT Strategies add further evidence that President Bush's approval ratings have improved significantly since Veterans Day. The new Gallup poll, taken 12/5-8 finds 43% approval and 52% disapproval. That compares to 38% and 57% in the previous Gallup poll taken 11/17-20. The Cook Political Report/RT Strategies poll, taken 12/8-11 shows a gain from 41% to 42% in approval, but also a gain in disapproval from 52% to 55% compared to the previous Cook/RT poll taken 11/17-20. This is the first sustained upturn in the President's approval since January 2005. Based on a statistical model that incorporates the year long trend and "house effects" of polling organizations, the current estimated increase since Veterans Day is 2.66%. However, it is worth noting that the increase now looks stronger than the current model will allow. An updated model is in the works. Stay tuned. In the graph above the local regression line, which does not depend on that model, estimates that the current resurgence in support now appears close to the pre-Katrina levels of approval in late August. The upturn has taken place in less than half the time of the decline since Katrina. There has been a great deal of speculation about "how low can he go". There has also been discussion of "free fall" in approval. The current evidence clearly shows that the Bush administration is still capable of rallying support. The questions now are "how long will the upturn continue" and "is it possible for the administration to restore stable and favorable approval levels"? There are few historical examples of second term presidents who have recovered from approval levels in the high 30% range. Thus any appeal to history rests on the weakest of evidence. The substantive driving forces remain mixed. The economy is doing well by historical standards, and consumer sentiment has recently improved. Gas prices are down. But the war in Iraq continues to cost lives and money. The domestic agenda lacks a clear positive thrust. What next? Being an empiricist, I'll wait and see. The Associated Press/Ipsos Poll conducted 12/5-7 adds further support for the upturn in approval of President Bush's job performance. In the poll, released today (12/9) the AP/Ipsos poll found 42% approval and 57% disapproval. That is up from 37% approval in the last AP/Ipsos poll of 11/7-9. The previous poll measured 61% disapproval. My model now estimates a statistically significant gain in approval of +2.82% since the Veterans Day launch of a more aggressive response to White House critics. That gain has now more than made up for the post-Libby indictment drop of -1.91% and is approaching parity with pre-Katrina levels of approval. The Katrina effect is estimated at -1.33%, so the net loss over these events is now -1.33-1.91+2.82=-0.42%. There has been an additional decline due to the long term trend in approval, which has been reversed for the first time since January with the 9 most recent surveys. While the White House cannot be pleased with 41% approval, the trend is clearly up for the first time since January, a clear win for the President. The addition of the CBS/New York Times poll, taken 12/2-6 has pushed the improvement in approval of President Bush into statistically significant territory, even accounting for variation in polling organizations. The CBS/NYT poll is the 8th taken since the more aggressive effort by the White House to defend it's Iraq policy and decision making. The CBS/NYT poll registered an increase of 5% since 10/30-11/1, from 35% to 40% approval. Disapproval also dropped 4% from 57% to 53%. With the new poll added to the data, the estimated Post-Veterans Day increase in approval of the president is now estimated at +2.07%, up from the previous estimate of +1.26%. Such a large change based on a single additional poll should provide some caution that these estimates are not yet stable. Nonetheless, the balance of the evidence now favors an interpretation that the Bush administration strategy and rhetoric is paying off in improved public approval. Approval of President Bush may have taken an upturn in the wake of his Veteran's Day defense of the Iraq war and renewed White House emphasis on responding to critics of the war. However, the upturn is not yet statistically significant, leaving some doubt based on the seven polls currently available since Veterans Day. 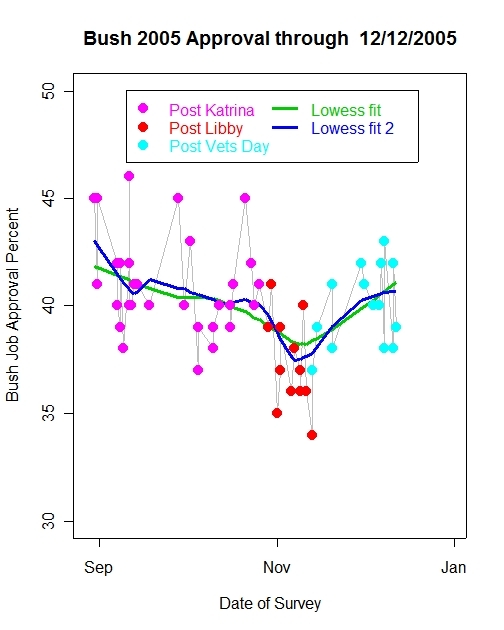 In the above graph, the general decline in presidential approval since Hurricane Katrina is evident, with evidence that there was increased decline following the week of the Lewis "Scooter" Libby indictment, the Harriet Miers withdrawal and the 2000th U.S. military death in Iraq. On November 11th, President Bush launched a new series of speeches, aided by Vice-President Cheney and other White House spokespeople, that vigorously defended the Iraq war, the President's use of intelligence and strongly criticized the arguments for a quick withdrawal of troops from Iraq. Coupled with good economic news, one might predict an improvement in the President's approval as he gives his supporters a renewed argument in favor of his handling of the presidency. The upturn in the polls is evident from the graph. What is still in question if whether the data are strong enough to give us confidence the increase is real, and not a random fluctuation in the polls. 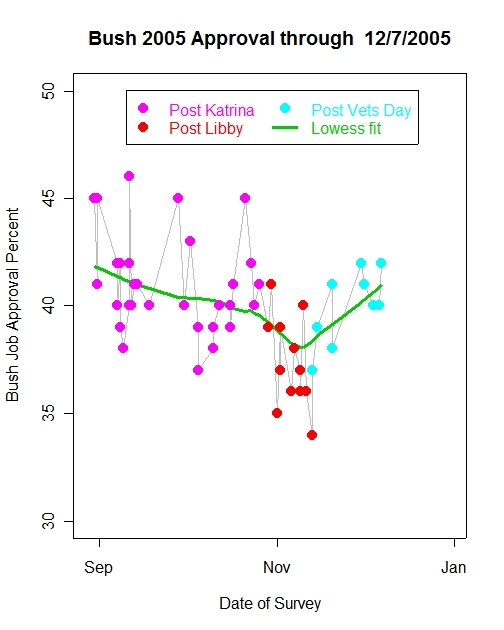 If we estimate a model of approval for the year that includes effects of Katrina, Libby and Veterans day, as well as the long-term downward trend seen all year, then the post-Veterans Day effect is a robust +2.85% improvement, and is statistically significant. However, these polls are themselves subject to persistent "house effects", the tendency of polling organizations to produce results that are consistently above or below the average of other polls. When we take these "house effects" into account in the model, the post-Veterans Day effect is a still positive +1.26%, but it is no longer statistically significant. A way to get a "feel" for this is to note in the graph that three of the seven post-Veterans Day polls are well within the range of variation of the previous trend. The other four polls all are either above that range or right at the top of the range. So the evidence is certainly suggestive, but not yet convincing beyond a reasonable doubt. While the Post-Katrina data are well below the box for Pre-Katrina, and Post-Libby is well below that for Post-Katrina, the current resurgence in Post-Veterans Day still significantly overlaps with the Post-Libby data. 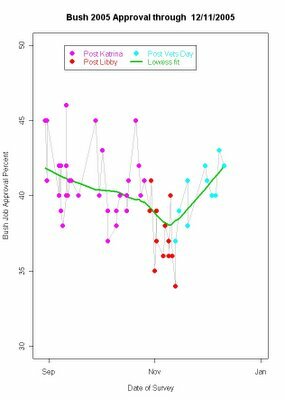 If the improvement in approval is real, we should see this box separate from the Post-Libby box. More polling, and a continued upward trend, could demonstrate that. The Thanksgiving holiday depressed the rate of polling, unfortunately, just when some new polls would be welcome. Hopefully the next few days will provide more data and more confidence in the trends. Data: The data include all national polls through December 4. This includes a Time poll taken over the weekend, and a Quinnipiac poll ending December 4. See The PollingReport.Com for the data. Note the comparison with my plots of Bush Approval over the year and over the term here and here. The year-long plot shows a small upturn at the end. The full-administration plot does not. That reflects the relative influce of these seven polls at the end of the data. The lack of statistical significance keeps the upturn looking small or non-existant in the more comprehensive graphs. As more data arrive, the late-trends will become more apparent there as well as here where I have "zoomed" in on recent developments, giving more influence to the last 7 polls in a smaller pool. President Bush's approval rating graphs have been updated. Not a whole lot of new polling since the last update, but some potentially interesting changes, not yet statistically significant. See the links to the right. Updated again with latest Quinnipiac Poll through 12/4. The early elections in Israel are providing an interesting example of party system change. Prime Minister Ariel Sharon's decision to quit the Likud party to form a new centrist party, Kadima, has not only split Likud, but also drawn some support from other parties as well. Likud has been dramatically hurt by the split, falling in polls to support worth only 12.8 seats on average across polls. Likud currently holds 40 seats. Likud has also been continuing to decline in recent polls (see below). The reduction of Likud from the dominate party in Israel to a modest sized third or even fourth largest party is a remarkable shift. Even with nearly four months of campaign left, and allowing for short term support for the new party to subside, this still looks like one of the most remarkable collapses in modern party history. Like a business worth more when broken up, Likud and Kadima are worth more seats than Likud alone was before the split. Prior to Sharon's decision, Likud was estimated to win 37 seats based on five polls taken shortly before the split. Since then Kadima and Likud together have averaged 46 seats combined. The increase in total support has come at the expense of the centrist Shinui party, which currently holds 15 seats in the Knesset. Since the Likud split, Shinui support has averaged only 5.3 seats in polls. 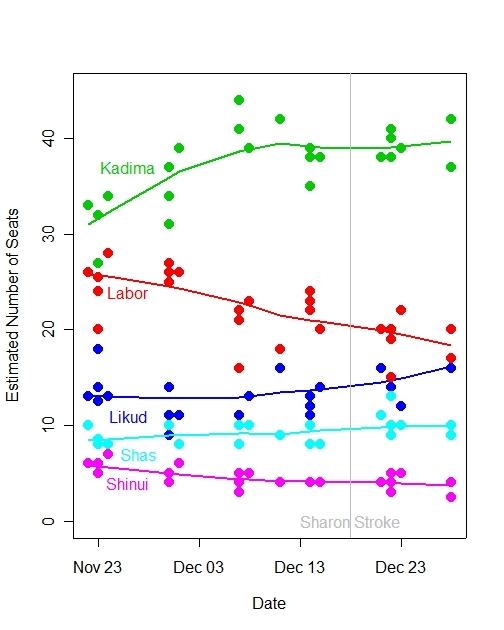 Shinui averaged 8.6 seats in polls before the formation of the new Kadima party, suggesting that not all of the loss from 15 current seats was due to competition from Sharon's new party. Three other parties in the figure above show visible loss of support. Labor has seen poll support decline from 27.2 to 25.2 seats. Shas has lost one seat, from 9.6 to 8.6 seats. National Union (Ikhud) has dropped from 6.4 to 4.8 seats. 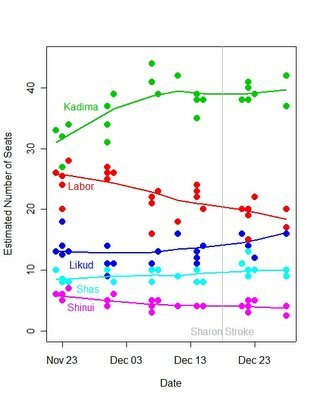 The campaign has a long while to run, but the first 10 days of polling has been kind to Kadima and harsh to Likud, with Labor holding steady or slightly gaining over the last 10 days. In the most recent round of polls, Kadima has support ranging from 31 to 39 seats. Labor is estimated to win 25-27 seats while Likud wins only 9-14 seats. For Likud this is a drop from the 13-18 seats they held a week earlier, immediately after Sharon left the party. Likud's prospects are currently also clouded by the choice of a new party leader. Finance Minister Benjamin Netanyahu commands the most support in current polls of Likud members, but among the entire Israeli electorate, Likud polls worse under his leadership than that of one of his competitors, Defense Minister Shaul Mofaz. In a poll conducted by Shvakim Panorama for Israel Radio on November 30, Likud wins 11 seats with Netanyahu and 14 with Mofaz. Earlier polling found Likud won four more seats with Mofaz than with Netanyahu (18 vs 14, November 23, Maagar Mochot for Makor Rishon.) Likud will choose its new leader on December 19. Clearly that decision could affect the dynamics we have seen so far. For those of us who study electoral and party systems, this is an exciting opportunity to observe a party system in change. For everyone, it is a powerful political story. Stay tuned. I'll update the polling on and off until the March 28 election. Data: The data are taken from two primary sources, both of which are excellent. Angus Reid Consultants in Canada has a nice collection of polls from all over the world. Their summary of polls from Israel usually include helpful commentary as well. Independent Media Review Analysis in Israel does an excellent job of reporting current polling, usually the same day polls appear, or the next. 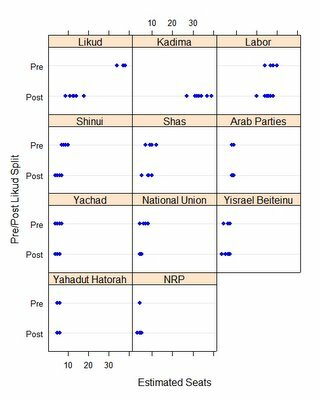 And one Note: Because the Israeli electoral system is extremely proportional and governing outcomes highly dependent on coalitions of Knesset parties, polls are routinely reported in terms of estimated seats won, rather than percentage of voter support. Raw percentage figures are in fact quite hard to come by. In particular, I am unaware of how undecided voters are handled in these calculations. That is a topic for another day.